Meet Justin Waldern of the University at Albany, SUNY. The fourth-year graduate student works with Marlene Belfort whose lab is part of the RNA Institute. 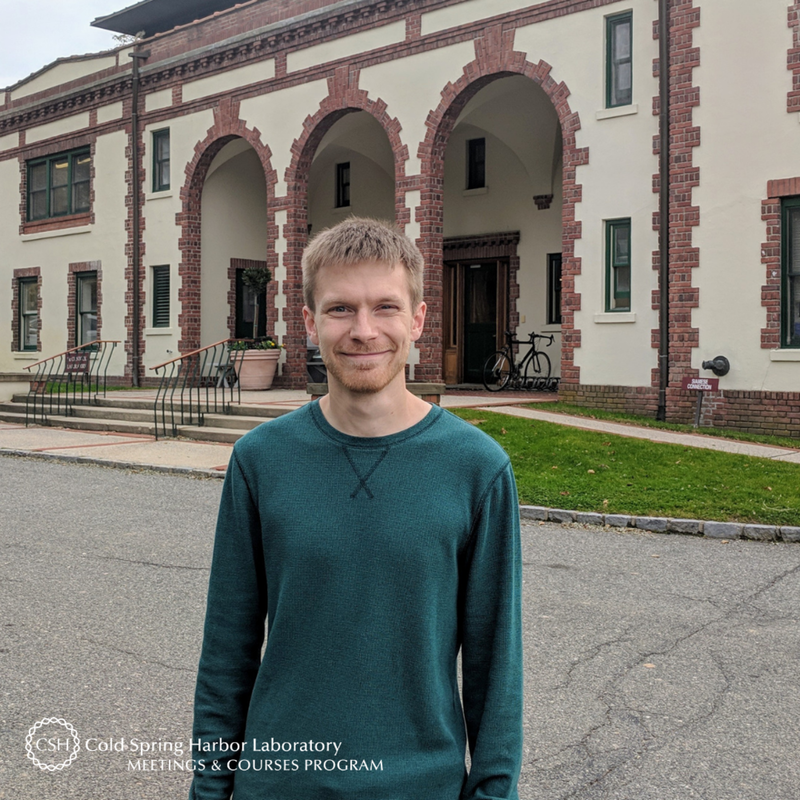 Justin is on campus for his first CSHL meeting – Transposable Elements – during which he gave a talk titled “Group II intron distribution aligns with host gene function”. My research focus is on mobile genetic elements (genes that can move from one location to another). Mobile genetic elements are everywhere; but what I’m interested in is where they are, why they are in these spots, and what they could potentially be doing there. The idea that certain genes can move around fascinated me. Even more so, the fact that they are in so many places makes me wonder why. An undergraduate degree requirement involving research is what really got me into science. I always enjoyed learning new things, but the hands-on immersion in research made me realize how much I enjoyed discovering something that nobody knows. Was there something specific about the Transposable Elements meeting that drew you to attend? First of all, I’ve heard fantastic things about CSHL meetings, and the Transposable Elements meeting in particular. This meeting has incredible researchers at the top of the field presenting their work, and to be presenting my own research alongside them is both humbling and an opportunity I couldn’t pass up. Mobile elements are everywhere! They have biological relevance and definitely aren’t “junk” DNA. New ways of thinking about mobile elements in a broader context. The meeting has been fantastic and perfectly balances high quality presentations with an environment that encourages networking. I’ve met so many people! This meeting is well organized and very centrally located, which greatly encourages networking and collaborations. Thank you to Justin for being this week's featured visitor. To meet other featured scientists - and discover the wide range of science that takes part in a CSHL meeting or course - go here.